Amanda Simmons/Press-Tribune | Students from T.O. Rusheon Middle School prepare their programmed robot for competition. 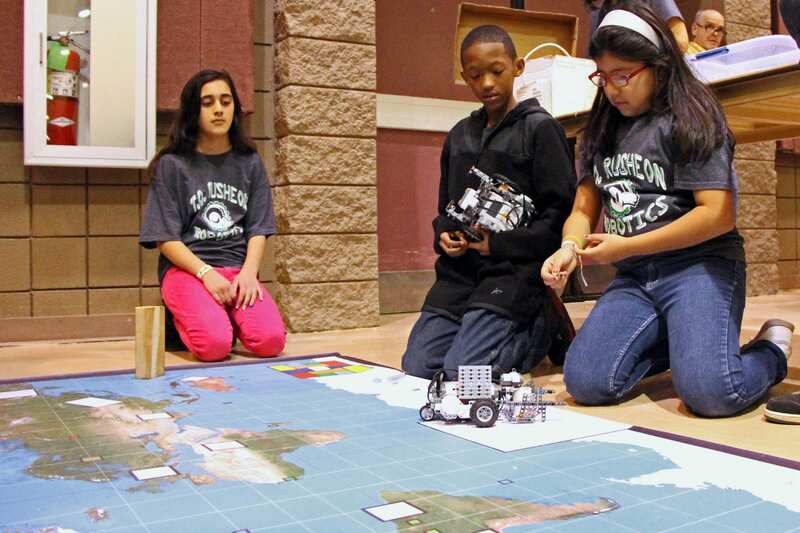 Over 220 elementary, middle, and high school teams have registered to compete in the 2015-2016 Regional Autonomous Robotics Circuit (RARC) Competition 2 this Saturday, February 20, 2016, at the Bossier Civic Center. Bossier, Caddo, Lincoln, Livingston, Natchitoches, Richland, Webster, and West Feliciana Parishes and Union County, Arkansas, will be represented. RARC is a series of three cyber and science, technology, engineering, and mathematics (STEM) competitions for students in grades 3-12. The competitions build upon one another and allow teams to showcase their cyber, STEM, and 21st century skills by competing against other teams within their division. Liberal arts lessons are also integrated to provide a context for the content. The competitions are sponsored by the Cyber Innovation Center’s National Integrated Cyber Education Research Center (NICERC), the City of Bossier City, Sci-Port: Louisiana’s Science Center, Bossier Parish Schools, and Caddo Parish Schools. The theme for the 2015-2016 RARC competitions is Exploring the Wonders of the World. The challenges require the teams to crisscross a competition mat that resembles a world map, learn about the wonders of the world, and accomplish tasks related to each wonder. Elementary school teams will compete in the morning beginning at 8 a.m. and will receive their awards at approximately 11:15 a.m. The middle and high school divisions will begin their challenges at 12 p.m. with winners announced at approximately 3:45 p.m. The competition is open to the public. To learn more about RARC, please visit http://nicerc.org/rarc/rarcla/.